Backbone Campaign, an advocacy organization based on Vashon Island, is bringing a 20’ blimp of Baby Trump to fly during VP Pence’s visit to Spokane on Tuesday. “The Vice President is complicit in an administration that continually engages in hateful and dangerous rhetoric, as well as shamefully infantile behaviors that divide our country and appeal to the very worst in our populace. Their celebration of sexist, misogynistic, and harassing behaviors are not new, but the events of this past week have demonstrated that they lack a moral metric for assessing the character of life-long appointments to the highest court in the land. 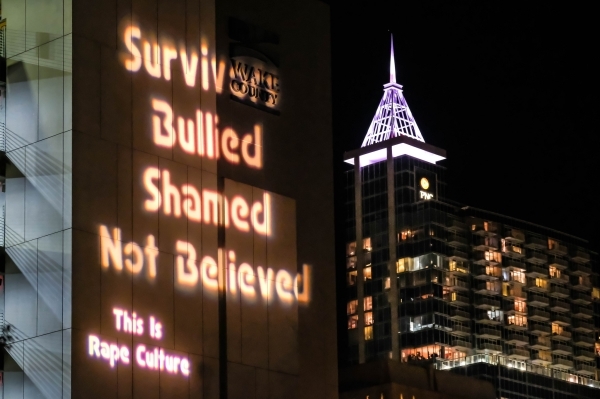 This is a betrayal of our mothers, daughters and granddaughters, and all who strive for a society that upholds the dignity of all people to be free from discrimination and to be safe from sexual violence,” says Bill Moyer, Executive Director of the Backbone Campaign. Backbone Campaign neither endorses nor opposes candidates running for office and is fiercely independent of political parties. “We have a 15 year record of artful activism on behalf of progressive values and of fighting regressive policies of elected officials, regardless of party affiliation,” said Moyer. The location of the deployment is currently undisclosed, due to threats posted on social media by individuals and the College Republicans at EWU and WSU. “For those who don’t like the balloon, too bad. A balloon hurts no one. Ridiculing the behavior of demagogues is an age old practice that encourages a citizenry to not normalize their terrorizing or obscene behaviors. 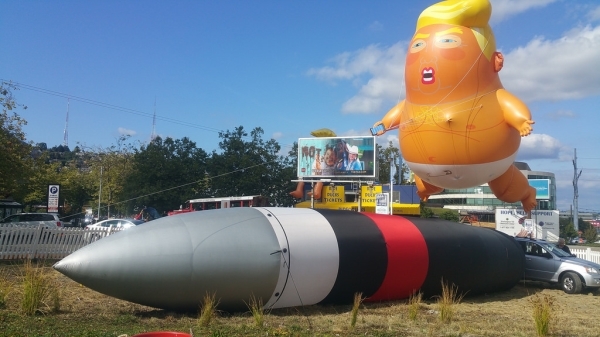 Coupling the Baby Trump balloon with an inflatable replica of a Trident 2 intercontinental ballistic missile is our way of demonstrating the danger of allowing such a person have such destructive capacity.